Farrar, Straus and Giroux, 9780374182311, 432pp. 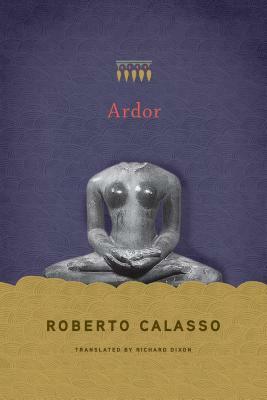 In this revelatory volume, Roberto Calasso, whom The Paris Review has called "a literary institution," explores the ancient texts known as the Vedas. Little is known about the Vedic people, who lived more than three thousand years ago in northern India: They left behind almost no objects, images, or ruins. They created no empires. Even the soma, the likely hallucinogenic plant that appears at the center of some of their rituals, has not been identified with any certainty. Only a "Parthenon of words" remains: verses and formulations suggesting a daring understanding of life. "If the Vedic people had been asked why they did not build cities," writes Calasso, "they could have replied: we did not seek power, but rapture." This is the ardor of the Vedic world, a burning intensity that is always present, both in the mind and in the cosmos. With his signature erudition and profound sense of the past, Calasso explores the enigmatic web of ritual and myth that defines the Vedas. Often at odds with modern thought, these texts illuminate the nature of consciousness more vividly than anything else has managed to till now. Following the "hundred paths" of the Satapatha Brahmana, an impressive exegesis of Vedic ritual, Ardor indicates that it may be possible to reach what is closest by passing through that which is most remote, as "the whole of Vedic India was an attempt to think further."